– Seth Moran, Ph.D., USGS Seismologist, Vancouver, WA. Mt. 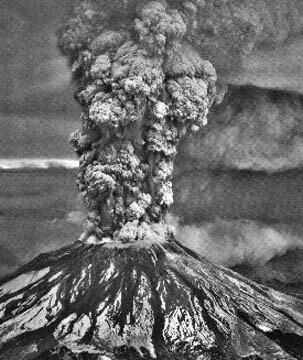 St. Helens has averaged an eruption every 100 years or so. The last big one above was May 18, 1980. The current earthquake swarms could be building up to steam release. Image © 1980 by Austin Post. Seth Moran, Ph.D., Seismologist, U. S. Geological Survey, Vancouver, Washington: “On Wednesday, September 21, 2004, we started seeing more earthquakes than we usually see at Mount St. Helens. We usually see maybe one a day. Wednesday, there was a notable increase. Then running through Thursday, September 22, we started seeing a lot of earthquakes occurring maybe one a minute. They were all very small, very shallow, and after awhile, the seismicity rate declined and on Friday, kind of went down and looked like it was going away. Then on Saturday, the earthquakes started getting bigger up to magnitude 2 and 2.5 on the Richter Scale. Then Saturday to Sunday, they started increasing again in terms of number occurring again per minute. We were back up to 1 or even 2 per minute. Where we are now is that the largest earthquakes are just a little bit below magnitude 2. They are still occurring at a pretty good clip of 1 or 2 per minute and it’s basically been in a holding pattern over the last twelve hours. IN A SITUATION LIKE THIS, WHAT DO YOU EXPECT TO HAPPEN? It’s hard to know exactly what to expect. There is a range of possibilities. One possibility is that this could die off and go away. Swarms happen in volcanoes and don’t leave anything. There was a swarm in 2001 at Mt. St. Helens where there were a lot of earthquakes, all very, very small. It did not last as long as this one has and did not get to the point where there were big earthquakes like this one has. But that one did die away without anything coming out of the volcano. There are other volcanoes around the world that have swarms and nothing comes of them. So, that’s one possibility that we can’t discount. 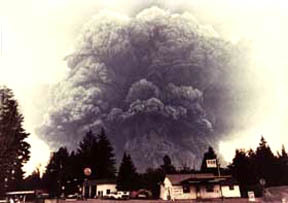 May 18, 1980, Mount St. Helens, Washington, erupts in gigantic explosion that blew off top of volcano. Photograph © 1980 by Roberta Dickerson/Murray. Mount St. Helens’s May 18, 1980, volcanic eruption changed (above) 200 square miles of rich forest into a (below) grey, lifeless landscape. Photo courtesy of Darrell Jennings. It’s also the case that this is well above what we’ve seen since the last big eruption in 1980, so we can’t discount the possibility that it could be some things that come out of the ground. And what we’re thinking is most likely is this whole sequence began several days after a very large amount of water came into the system through a series of storms. Our best guess for what might happen at this point is that some of that water might come in contact with hot rock. In fact, that’s what we think might have started this whole sequence, water coming in contact with hot rock. If there is any kind of steam, it’s created down at depths and builds up and could generate enough pressure we could see some steam explosions coming out of the dome. If that were to happen, that would likely kick up some rocks off the dome and put them in the crater floor, potentially up on the volcano rim. That’s our operating hypothesis for what may happen. But it also can’t be discounted that this could lead to something more significant than that. WHAT ARE THE CHANCES THAT THIS COULD GO TO FULL BLOWN MAGMA LIKE A VOLCANIC ERUPTION? It’s certainly something that we’re not discounting. It’s a possibility. We’re not thinking at all that this is going to be like 1980, not a big gigantic blow, that cataclysmic sort of thing. In 1986, we had the last of a series of eruptions that built up a lot of dome in the crater. At that point in time, nobody thought that was the last eruption. Our expectation was that the volcano would fill itself back up again and rebuild the volcano as it has done in the past, and as other volcanoes have done in the past elsewhere. So, the fact that it stopped building up was kind of a surprise and one possibility ­ it’s not our dominant thinking right now ­ but there is a possibility that we could see the heralding the beginning of another sequence of dome building eruptions, which are very benign unless you are in the crater floor or on the rim. That’s another possibility. But I emphasize that this point that we’re not thinking eruption, we’re thinking more like steam explosions. WHAT ABOUT THE GENERAL CASCADE MOUNTAIN CHAIN THAT INCLUDES VOLCANOES AND QUESTIONS ABOUT WHETHER ANY OF THEM ERUPT? 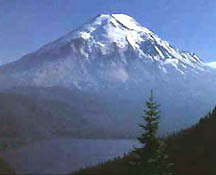 COULD THIS ACTION IN MOUNT ST. HELENS SET OFF OTHER ACTIVITY IN SOME OF THE OTHER VOLCANOES? No, each volcano has its own plumbing system and it goes down ­ it does not go horizontally or laterally. Every volcano has its own behavior, its own rate. Mt. 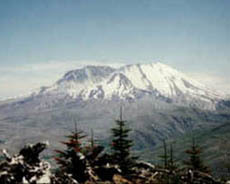 St. Helens is much more in the geologic record has been much more frequently active than any other volcano in the Cascade Range. On average, it erupts about once every 100 years. So, we expect Mt. St. Helen’s where the next eruption is most likely to come in the Cascade Range, just based on that frequency. Other volcanoes don’t have that kind of frequency rate. There is another system in the Cascade Range that has been having unrest for five to eight years now. There has been a small patch of ground off to the west of South Sister that has been slowly deforming. Our interpretation for why it is deforming is that there is magna moving at depths of five to six miles down. It could very easily be something that happens naturally to that volcano. It could also be a longer term warning and so we’re also paying attention to South Sister. HOW FAR IS THAT VOLCANO FROM MT. ST. HELENS? Takes four hours to drive from Vancouver USGS Volcano Lab, so maybe 200 to 250 miles away. THERE HAS BEEN CONTROVERSY THE PAST TWO YEARS ABOUT YELLOWSTONE PARK. THERE IS A BULGE THERE AND HEATING OF PATHS AND THE PUBLIC WONDERS IF SOMETHING IS ABOUT TO BLOW IN THE PARK? CAN THERE BE ANY CONNECTION BETWEEN THE CASCADE RANGE AND WHAT IS HAPPENING VOLCANICALLY BELOW YELLOWSTONE? No. It’s rare that you’ll get a scientist who says something definitive, but magma rises vertically. Very little moves laterally because magma is less dense than rock and it’s going to go upward, not sideways. There is no direct connection between Yellowstone and the Cascade Range. The Cascade Range as a whole is being created by a common process, which is subduction of the Juan de Fuca plate. That plate has been subducting underneath the North American plate for millions of years. When plates go down, oceanic plates in particular ­ there is a lot of water in them which comes up out of the rock as it goes down into the earth and gets hotter. That water comes up and helps create magma and the magma goes upward. Yellowstone National Park is not even a part of that process. Yellowstone is a hot spot and it’s its own thing. AS WE SPEAK AROUND 12:30 P.M. EAST COAST TIME ON MONDAY, SEPTEMBER 27, WHAT RIGHT NOW IS THE CURRENT RATE OF SEISMIC ACTIVITY? It looks like one/minute at about magnitude 1. YOU DID HAVE SOME THAT WERE 2.0? Yesterday (Sunday, Sept. 26, 2004), the largest one was a 2.8. IN LOOKING BACK THROUGH THE HISTORIC RECORD WHEN THERE HAVE BEEN SWARMS LIKE THIS, WHAT IS THE PERCENTAGE CHANGE THAT THIS WILL GO INTO ERUPTION? That’s hard to say. There are two historical records. One has happened all around the world and then there’s what’s happened at Mt. St. Helens. Each volcano behaves differently. It’s hard to say. I think what you can say is the longer this goes, the less likely it is that it will just die away and nothing will happen. MEANING, IF THIS KEEPS UP, SOMETHING IS GOING TO HAPPEN? Yes. That’s based on a general pattern of swarms in volcanoes around the world. Usually they last for a couple of days and then go away, if they are going away. The longer this goes on, the more it steps outside of that pattern. WE ARE AT MONDAY. IT BEGAN LAST WEDNESDAY. SO JUST IN A COUPLE OF DAYS IT WILL HAVE BEEN A WEEK. NORMALLY IN A WEEK OF SUCH ACTIVITY, THEN SOMETHING SHOULD BREAK LOOSE? Well, not necessarily break loose, but we expect to see some changes. I can’t give you a time when I would expect something to happen. What I can say is that there are changes we are looking for in the nature of the seismicity on an ongoing basis. We are looking for events to get bigger. We are looking for events to be more frequent and we are looking for them to change their character. When you actually have magma moving, or fluid moving, through the ground, you get a different kind of earthquake than what we are seeing right now. We are looking for changes. Right now, we are seeing elevated seismicity and we have some ideas for what might be going on. But to start thinking along the lines of magma and eruption, we have some specific things we are looking for in the seismicity itself, as well as we’re trying to get more information about other parts, other things in the volcano, like gases coming out or increased temperature coming out.